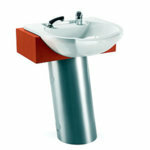 The Aqua Pedestal Frontwash is DDA Compliant, designed to give easy access for wheelchair users. 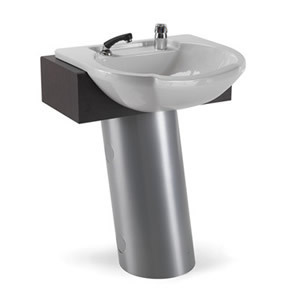 It features a silver pod with a timber top structure which is available in any REM laminate (please use the drop down box to choose) the porcelain frontwash basin comes with a monobloc mixer set as standard. Sizes: Width 65cm, Depth 60cm, Basin Height 83cm.